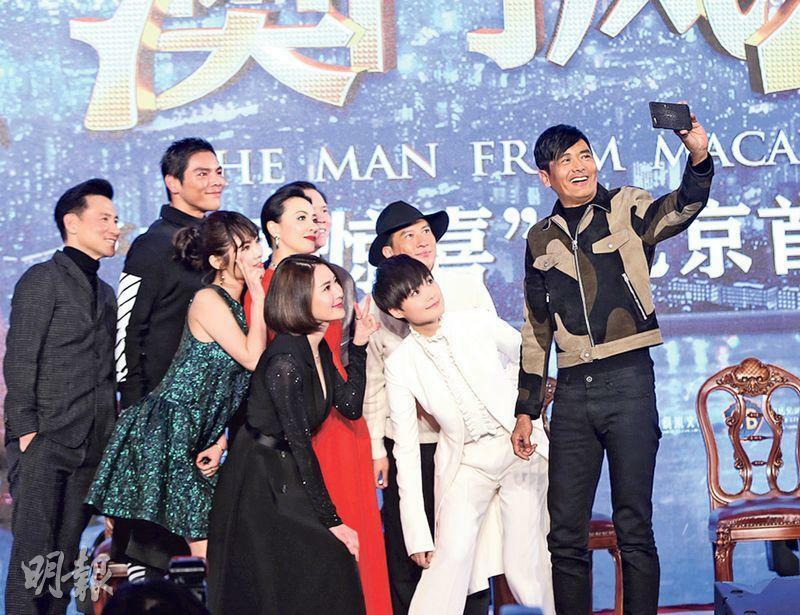 Huang Xiaoming posts photos with Chow Yun Fat, "Seeing Master again." The Wong Jing, Andrew Lau Wai Keung produced and directed, Chow Yun Fat, Andy Lau Tak Wa, Jacky Cheung Hok Yau, Carina Lau Ka Ling, Nick Cheung Ka Fai, Chris Lee Yuchun starred Lunar New Year film FROM VEGAS TO MACAU 3 (DOH SING FUNG WON III) yesterday afternoon held its Beijing press conference. Wa Jai was unable to attend. The event not only released the film's ultimate trailer but the actors also interacted. In the ultimate trailer, Fat Gor had fun at the expense of his classic film scenes and lines like "I hate it when people poke my head with their finger". Yet after he said that, Wa Jai still daringly kept poking at Fat Gor's head and Fat Gor kept screaming in pain. Later Fat Gor asked Wa Jai to lend him his condor to play with, Wa Jai asked in fright, "Which condor?" Ka Ling in the film teamed up with Hok Yau as the villains. She said, "Actually in FROM VEGAS TO MACAU 3 I am not the villain. I have been working very hard on playing a quiet and beautiful woman. Hok Yau did a lot that I didn't know about." Hok Yau heard and helplessly said, "That doesn't matter, you are all good guys. I am the only bad guy. I am very happy. Because I read in the script that I was the one and only villain I agreed to the role. Being able to act with Best Actors, being able to romance a Best Actress, all my subordinates are so pretty, I am very grateful!" Later the host asked the actors to sum up their production experience with one word. Ka Ling used the word "wish". She explained, "This film enabled me to work with so many gods once and even had a deep romance with two of them. It fulfilled a big wish for me since the start of my film career." Hok Yau chose "love". He said that he was love struck in the film as he had a relationship with Ka Ling. When he sang the film song FREEZE FRAME he also put in the deepest love. Ka Fai chose the word "cool". He admitted that he had a scenes with Fat Gor in FROM 2. This time in FROM 3 he got to act with Wa Jai and Hok Yau. Thus he kept saying "cool". This time aside from dressing up in tight clothing, as a condor and Spider-Man, he would also display his comedic nature as "Dragon". "Actually I have never been fond of Mr. Fa (Dragon), but this time Wong Jing forced me to mess around and Mr. Fa had to return." Fat Gor chose a laugh until you cry emoji in lieu of "joy". He said, "When everyone watch FROM 3, they definitely will laugh until they cry." This production I have with so many new and old friends. During the shoot everyone is overjoyed. In the entire process everyone chatted and laughed, we were very happy." 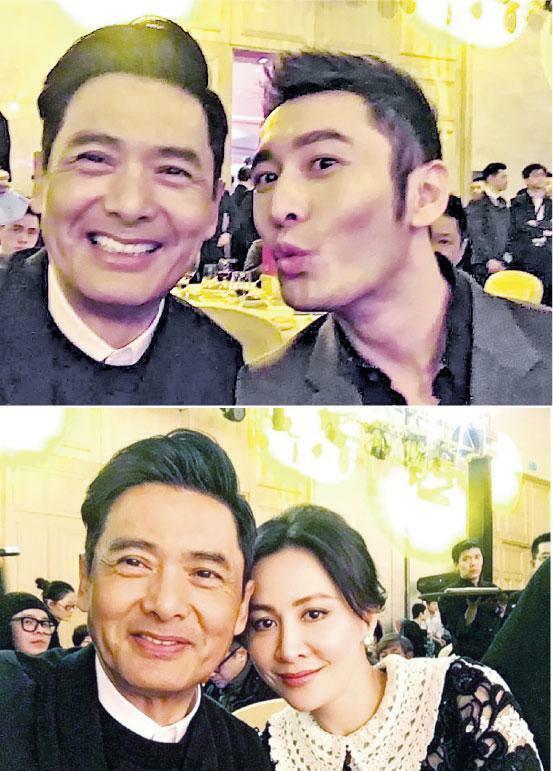 When someone asked about Ka Fai and Hok Yau's resemblance, before they could reply Chow Yun Fat already answered that their relationship was "special". "They are sick, they both ditch their wives to go for hot pot casserole." He even turned into a reporter and interrogated them. Ka Fai stated that he and Hok Yau were good friends and good brothers, but they were not lovers. "I am only interested in women." Ka Ling jumped in and said that Ka Fai and Hok Yau finally found their soulmate in each other. 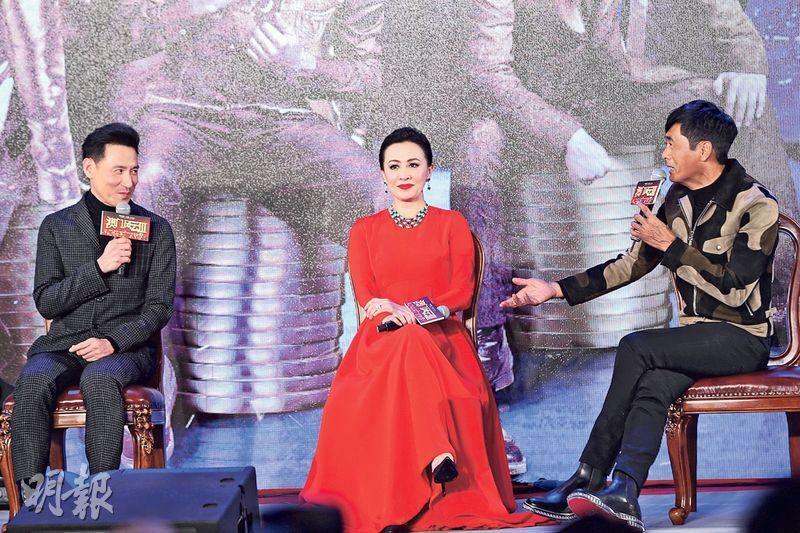 She even revealed that Ka Fai often hummed Hok Yau's songs on the set. Chow Yun Fat immediately asked Ka Fai to sing Hok Yau's hits. Finally Ka Fai could only comply, stood up and sang Hok Yau's classic "KISS GOODBYE". Hok Yau also harmonized a few verses and praised Ka Fai for his decent singing. "He sang the KEEPER OF DARKNESS (TOR DEI KUI MOR YUN) theme song very well, better than even my songs. From now on don't sing my songs anymore!" Hok Yau also daringly expressed his love for Ka Ling, "Actually in real life I like Ka Ling too, unfortunately I can't get her." Ka Ling jokingly asked him why he did not say anything sooner. Hok Yau bashfully said, "Because (Tony) Leung Chiu Wai is a good friend of mine." Ka Ling then asked Lau Wai Keung to make a movie to fulfill their couple dream. Chow Yun Fat humorously said, "Then I will be the villain, but Ka Ling every night would dream of me. Even after this resurrection she is constantly following me, she loves me and not Hok Yau. However I also respect Hok Yau, if he wants her he can have her." Hok Yau was asked about his "Harry Potter" like costume. "Maybe the director felt that I didn't look good in short hair. I felt the long hair wig was a lot of fun, it was like fulfilling one of my wishes because I had a very hard time with keeping my hair long." Lee Yuchun also stated that her "happiness index" greatly elevated for being able to work with so many idols. She even praised Ka Fai for his extra special treatment. She was very nervous about her scene in which she threw cake on Chow Yun Fat's face. "Because I know it would be the first time in several decades that Fat Gor got cake thrown at him, I was so nervous that I clinched my fist as I hoped to throw accurately in one take. Finally I successfully got it in one take!" During the event when Lau Wai Keung humorously admitted that he conned Lee Yuchun to make a "modern" film. Lee Yuchun made fun of his poor Mandarin. "Is it modern or 'pretend to death'?" Xu Dongdong described the new film as "beautiful". "Because in the film I had a tattoo and gamble with Cheung Ka Fai, I felt the appearance looked rather beautiful. My life was very beautiful to have this production experience." Playing a killer Michelle Hu Yan felt that it was very cool and said that she was very honored to be able to work with Cheung Hok Yau and Lau Ka Ling. 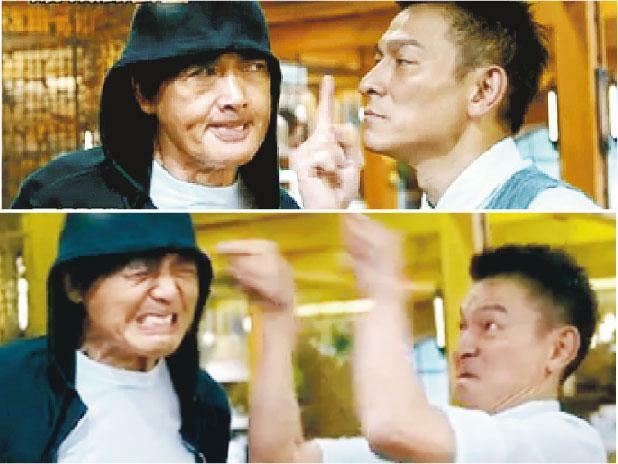 Bona boss Yu Dong said that he felt very happy to be able to work with the "iron triangle" of Wong Jing, Lau Wai Keung and Chow Yun Fat for several years in a row. He was full of confidence. "In previous years the films made 500 million and 1 billion RMB. This time I am confident that the third film alone will exceed the two predecessors' total of 1.5 billion for a three year total of 3 billion." Wong Jing also was full of confidence in the 250 million investment. "It will break all past New Spring slot total box office revenue." He also pointed out that this time he used 1500 special effect shots, built 10 sets and joked that he almost used all of the available Hong Kong studios. "The colleagues say we are bullies." However he said that FROM 4 2ill not be made next year but they will still work with Chow Yun Fat on another comedy subject.